It's hard not to have a good time listening to Iridescence. 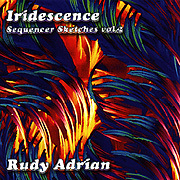 Rudy Adrian's fresh insight into the Berlin School of electronic music combines his sensual memory of the natural world with suprising shapes of glowing analogue sound. 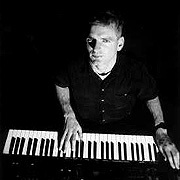 Coaxing classic warm timbres from his synthesizer, Rudy Adrian transmits the most cosmic of ideas with instinctual accuracy. Syncopated synth patterns beneath confident lead melodies rise out of vast cerebral preludes and provides each piece with its own unique contour. Detuned drones, shifting pads and elated harmonies give Iridescence an introspective quality and vivid dimensionality while the album's rhythmical cadence and lilting melodies provide a bright and lively focus. On a few of the pieces we hear the human voice, wordless singing processed with reverb and echo - a wonderful signature. Elsewhere, the artist's voice is expressed through his unrestrained playing, so vulnerable in its joy of discovery.